Last weekend, a small group of neo-Nazi geeks, White supremacist nerds, and extreme-right yoof met-up in Sydney to talk shop. 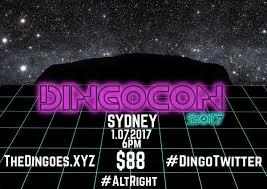 Called ‘DingoCon’ and organised under the auspices of #DingoTwitter, the only person to have publicly confessed to having paid their $88 (fnarr fnarr) entrance fee is Melbourne-based neo-Nazi Blair Cottrell, the putative leader of the now defunct Facebook page ‘United Patriots Front’ (UPF). One person who definitely did not attend — and whose presence would apparently have been unwelcome — was Dr Jim Saleam of the Australia First Party: Everyone Wants To Be Fuehrer, but it would seem that the nü gen of Fashy Goys are keen to keep some distance from the fascists in cardigans. 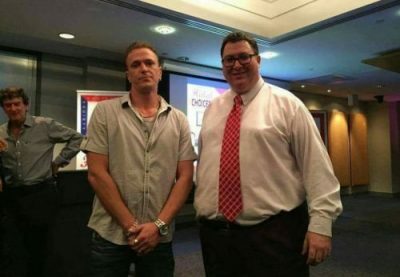 Above : George Christensen poses with Kane Miller, lvl boss of the ‘True Blue Crew’. Last week, for the second time, former Labor leader Mark Latham appeared on The Convict Report, aka The Dingoes, an Australian “alt-right” podcast. 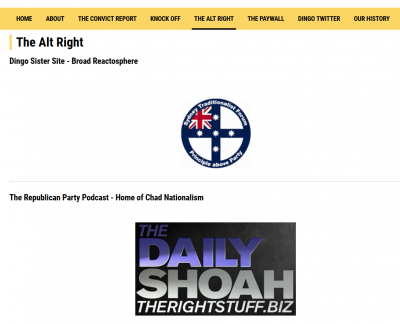 It’s part of the network of podcasts hosted by The Right Stuff, a major international far right hub. That’s the same website whose major players have been recently doxxed by the left, and whose unmasking as promoters of fascist ideology has, in some cases, brought suitably ruinous consequences. Bernardi also has other, perhaps even stranger connections. In particular, he has a long relationship with a group called the Sydney Traditionalist Forum. They describe themselves as “the first explicitly paleoconservative-leaning association in Australia”, and “the only local group that embraces the political currents of contemporary dissident reaction”. Their purpose is to provide “a forum where ideas once understood to be common sense can be exchanged, debated and discussed, unfettered and ungagged by modern liberal thought-control”. The Sydney Traditionalists, as it happens, are also comrades of The Dingoes; which fact — together with their rejection of Dr Saleam — has apparently irked the authors of the United Nationalists of Australia (UNA) blog. Functioning largely as a forum for (Jewish?!) neo-Nazi and AFP member Nathan Sykes, but also occasionally featuring the musings of former UPF leader turned AFP member Chris Shortis, the UNA blog replaced the similarly batshit ‘Whitelaw Towers’, and frequently takes potshots at the various enemies and rivals of Saleam and the AFP. In keeping with this role, the blog has recently published an account of DingoCon and the nefarious forces allegedly pulling its strings. 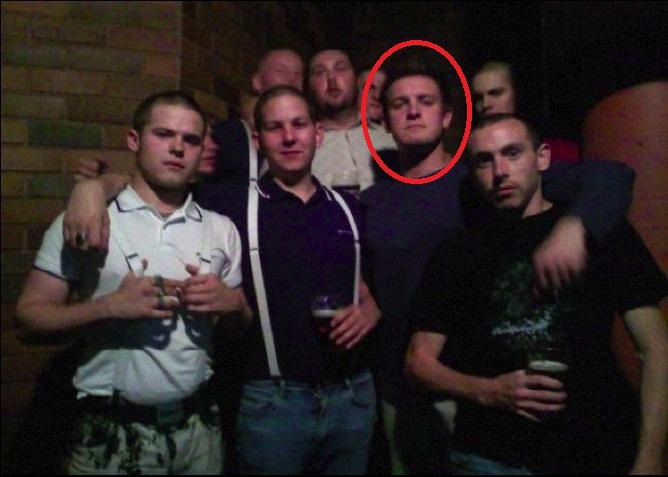 Above : Andrew Wilson with fellow members of (defunct) neo-Nazi skinhead gang Volksfront. Other individuals nominated as being in some way complicit in McBryde’s plotting to undo the (White) nationalist content of The Dingoes and to bring its handful of followers (back) into the Liberal fold are: Sydney Traditionalist, DingoCon organiser, aspiring academic and self-described ‘paleo-conservative’ Luke Torrisi; fellow Traditionalist, sometime Humanist and USYD activist Morgan Qasabian and finally; Clifford Jennings, described by Saleam as an ‘Alt-Right leader and the organizer of Dingo activity’ and a former Liberal: also an aspiring USYD student politician, and organiser of a ‘Pro-Trump Counter Protest’ in Sydney in January (‘Communists, Marxists, Globalists and Cucks are going to be protesting against the inauguration of the God Emperor Trump to the Presidency of the United States of America, please join me in a very merry counter protest. Please invite those who are truly pro-Trump.’). In summary, it’s not without reason that Jason Wilson wrote that ‘The Dingoes attempt to produce the same edgy fare as The Right Stuff flagships like The Daily Shoah, but they sound a little too much like chinless Young Liberal nerds to bring any real menace’. Beyond that, while much media reportage on the ‘AltRight’ has been obsessed with the bells and whistles (haircuts and memes) attached to it, as a general rule it’s just the old anti-Semitic and fascist whine in new bottles. See also : Are These Two Jewish Dudes The Aussie Voice Of The Alt-Right?, Leon Gettler, Forward, April 5, 2017 | The Dingoes claim to be ‘growing’ part of Australian alternative-right political scene, Victoria Craw, news.com.au, December 5, 2016 | Big Nazi on Campus: How Well Dressed Racists Are Coming to a College Near You, It’s Going Down, May 15, 2016 | Dialectic of Counter-Enlightenment: The Frankfurt School as Scapegoat of the Lunatic Fringe, March 9, 2012. * Conservative MPs accidentally-stumbling-into-fascist-and-anti-Semitic-groups has a long, colourful, and generally comedic history Down Under. STRAYA has also often been a safe space for Nazi war criminals, some few recruited by the intelligence agencies to better battle Communism while others, most notoriously Slovenian Nazi propagandist Ljenko Urbančič (1922–2006), pursuing careers within the Conservative parties themselves. Urbančič, who joined the NSW Liberal Party and exercised considerable influence upon it during the 1960s and 1970s via the ‘Uglies’ faction, also enjoyed Australian hospitality by organising campaigns in support of apartheid, White rule in Rhodesia, and against the influence of liberals within the Liberals. The political legacy of the ‘Little Goebbels’ of Ljubljana continues to be exercised and/or exorcised via his #BFF and NSW state MP David Clarke and Clarke’s former acolyte, federal MP Alex Hawke. For more infos on STRAYA as a safe space for Nazis and war criminals, see : Mark Aarons, War Criminals Welcome (Black Inc., 2001). Sadly, Mike Peinovich (‘Mike Enoch’) did not attend DingoCon, instead electing to goto the Scandza Forum in Oslo, Norway on July 1. Erik Olson (Searchlight) writes: ‘Recently a small “volkisch” far-right group called Scandza Forum started making its presence felt publicly with calls for more international activity. Some minor events took place and then we learned from our inside sources that a major event was to take place in Oslo on 1 July 2017 under the Scandza banner heavily supported by Greg Johnson’s Counter-Currents.’ Note that Johnson was a guest of The Dingoes in September last year. This entry was posted in Anti-fascism, Media, State / Politics, Student movement and tagged #DingoTwitter, Alex Hawke, Alternative Right, altright, Andrew Wilson, Anti-Semitism, Aussie Tory, Australia First Party, Blair Cottrell, Chris Shortis, Christopher Shortis, Clifford Jennings, Cory Bernardi, David Clarke, David McBryde, DingoCon, Donald Trump, Dr James Saleam, Dr Jim Saleam, Eureka Youth League, George Christensen, God Emperor Trump, Humanist, Humanist Society of New South Wales, James Saleam, Jason Rafty, Jim Saleam, Kane Miller, Klub Nation, Klub Naziya, Liberals, Liberals NSW, Ljenko Urbančič, Luke Torrisi, Mark Aarons, Mark Latham, Mark Pavic, Matthew Grant, Mike 'The Right Stuff' Enoch, Mike 'The Right Stuff' Peinovich, Mike Enoch, Mike Peinovich, Morgan Qasabian, Nathan Sykes, Nathaniel J.S. Sykes, Nathaniel Jacob Sassoon Sykes, Nathaniel Sykes, NSW Humanist Society, NSW Humanists, Patriotic Youth League, Patriotik Yoof League, Q Society, Scandza Forum, Steven Moore, Sydney, Sydney Traditionalist Forum, Sydney Traditionalists, The Convict Report, The Daily Shoah, The Dingoes, The Q Society, The Right Stuff, TheDingoes.xyz, therightstuff.biz, TRS, True Blue Crew, Trump, UNA Media, United Nationalists Australia, United Nationalists of Australia, United Patriots Front, University of Sydney, Viva Presidente Trump!, Volksfront. Bookmark the permalink.